How do you describe a nurse? Terms like giving, caring, and passionate traditionally come to mind immediately. Often, terms like scientific exploration, scholarship, and research are secondary descriptors. Not so for Sigma nurses. 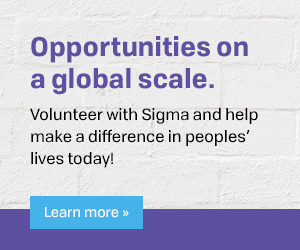 Sigma nurses and nurse researchers understand that scientific exploration, scholarship, and research continue to drive innovation and discovery within the field of nursing, thus driving the field forward. It is considered a very important aspect of the profession, so those secondary descriptors make sense, especially to Sigma nurses. Sigma nurse researcher and Chi Omicron at-Large Chapter member Dr. Adesola Adenike Ogunfowokan thought it made sense too. She saw something within her community that she wanted to positively change, and she knew that research and scientific exploration could provide the opportunity for that change to occur. Her journey with Sigma began seven years ago when, impressed by the connections and opportunities afforded to Sigma nurses, she was thrilled to join the Chi Omicron at-Large Chapter. Now, senior lecturer and acting head of the Department of Nursing Science at Obafemi Awolowo University in Ile-Ife, Osun State, Nigeria, Adesola can continue to herald the importance of research, scholarship, and Sigma to our next generation of nurses. Adesola, initially interested in community health nursing, graduated with her bachelor of nursing science degree in 1997 and, like many Sigma nurses, took her first appointment as a clinical nurse. Later, she secured a position at the Obafemi Awolowo Teaching Hospitals Complex in Ile-Ife, Nigeria but was unable to be appointed as a graduate nurse due to the stigma surrounding the need for advanced clinical nursing degrees at the time. Adesola, being called to the research and scholarship side of nursing, however, pushed through this stigma. It wasn’t long until she secured an appointment as a Nurse Clinical Lecturer at her alma mater and enrolled in the Community Health Nursing program, earning her MSc, her PhD, and the title of Senior Lecturer, all by 2012. By 2014, Adesola was selected as a Fellow for the Sigma/IDEN postdoctoral fellowship at Johns Hopkins University School of Nursing in Baltimore, Maryland, and has since been selected as a Sigma Small Grants recipient to further her research of sexual abuse experiences and the effect educational intervention has on the prevention of sexual abuse among adolescent girls.